"Welcome to Friday Night Smackdown and we are starting tonight with the meeting between Triple H, Stephanie McMahon and Gabby Bryan," Michael said. "This is what the WWE universe has been waiting for and we are going to see it right away," JBL exclaimed. Triple H&apos;s music hit and he stepped out, along with Stephanie. They both made their way down the ramp. Triple H had a contract in his hands. "Wonder what Triple H has in his hand," Michael mentioned the contract as Triple H and Steph stood in the ring. "Welcome to Friday Night Smackdown!" Triple H exclaimed. Stephanie spoke next, "We are so glad to be here tonight to perform in front of all of you, because tonight, we are announcing our first match, our main event." "That&apos;s right, tonight in this very ring we will have the Big Show...." he got an average response, "vs Randy Orton..." the crowd cheered, but Triple H wasn&apos;t finished, "And The Shield in a four on one handicap match." "But that&apos;s later tonight, first we have important business to attend to," Stephanie sat one of the chairs and Triple H sat next to her, "Gabby, get out here." Unstoppable(No Way Out 2012 theme song) blares threw the speaker and I stepped out to a standing ovation. I wore skinny jeans with some rips, white and blue Osiris with black laces and a white T shirt that said Gabby Bryan on the front in blue letter that were bubbled. I grinned and turned around and pointed to my back. 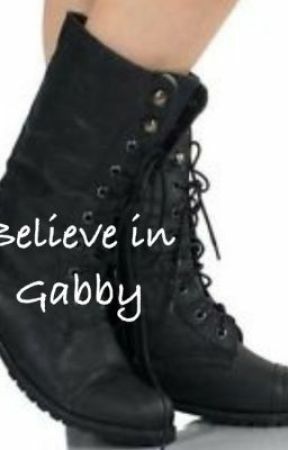 In the same lettering, it read:#wewantgabby. I started walking down the ramp and tagging the fans hands. When I got to the steel steps, I jumped on the barricade near them and put my hands up. The fans behind me yelled and patted my back. I jumped down and climbed on the steel steps and got in the ring. I looked at Triple H and Stephanie as I got on the top rope and held my hands up. I got down and walked over to the table. I stood on the other side opposite from the other two as my music cut. "Welcome Gabby, as you can see we have no Shield out here, this is just going to be between the three of us. Feel free to get comfortable," Triple H motioned to my chair. I nodded and sat down on the chair and grabbed the last microphone on the table and looked at the crowd, "Do you like my shirt?" The crowd cheered as I grinned, "There selling these now you know. In fact, you can get it now on WWEshop.com," I winked at a nearby camera and turned back to Triple H and Stephanie, "Alright, go ahead Trips, say whatever you got to say." Triple H grinned, "Your right, Gabby, why don&apos;t we just get right to it." I nodded as I laid my feet on the table and laid back. Stephanie shoved the contract on the table towards me, "What you see in front of you is something that you have wanted, something that you have wanted since you were a little girl. You&apos;ve been asking for it for months now and you will finally receive. What you see in front of you, Gabby, is a WWE contract." The crowd cheered as I quickly grabbed it off the table and looked through it, I grinned and shut it, setting it on my lap, "don&apos;t get me wrong, this is what I want and everything, but whats the catch?" "No catch, Gabby, we&apos;re simply doing it, because its what is best for business," Triple H said. Stephanie started talking, "Last week on Raw you competed twice. Once with Dean against Fandango and Summer Rae and the other time with all three members of The Shield against Dolph Ziggler, The Usos and Eva Marie. Although the Shield probably did most of the work, you still proved that you belong here and for that you deserve a contract."